Sue has been an American College of Sports Medicine (ACSM) Personal Trainer for five years. Her certifications include ACE group exercise, TRX, Livestrong, and Diabetes Prevention Coach. 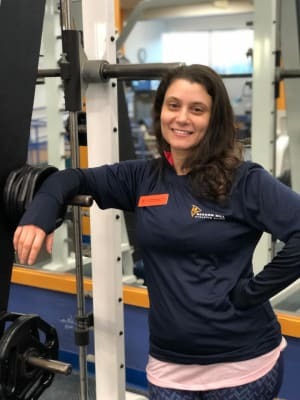 She specializes in muscle hypertrophy (growth), strength training, fat loss, and increasing range of motion with individuals that suffer from arthritis. She is especially satisfied working with under served, at-risk populations and those who find it difficult to maintain a healthy lifestyle. She is the creator and founder of REVIVE, a health and wellness program held here at Beacon Hill Athletic Clubs in Brookline Village. "Fitness is my passion and I love helping others become stronger, healthier individuals. My training philosophy is that human beings are like their muscles - the more you break them down, the stronger they grow back!" I love this gym! I belong to the Cleveland Circle location. It's a very welcoming environment, and the staff are friendly and helpful. It's super clean and has tons of fun class options and weights/machines. The Zumba class is my favorite so far. I'm very glad I joined. I’ve been coming here for over two years and have been really happy with my overall experience. The gym has all the machines and equipment I need and the layout of the space makes transitioning between workouts seamless. It’s also super close to my work and home, which makes working out multiple times per week really easy! Great athletic club! Offers everything I need for my lunch time work outs; free weights, dumbbells, universal machines, treadmills, the yoga room for stretching and core workouts. Love that you can sign up for a yoga class and others without any additional fees. Very clean & the support staff are awesome! Looking forward to the rest of 2019 with you guys.